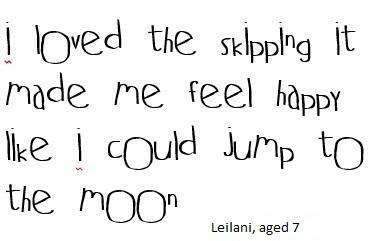 We get great satisfaction from seeing the children skipping around the playground after one of our skipping days, working on the challenges we've set them through our resources that we send free to schools who have booked a day with us. And it gives us even more delight when we receive letters and paintings from the children that we've coached, so much so that we want to share them with you. After all you know what they say, '"Out of the mouths of babes...."
Thank you for coming to Castle Park School to teach the whole school skipping. Year 5/6 really enjoyed keep the pot boiling with you. We enjoyed working with you and watching the demonstration. Thank you also for showing us the different moves they were great. We play keep the kettle boiling every day now in the playground and we use all the moves. Most of the skipping ropes are sold and we really enjoy them. We really enjoyed you coming in so thanks again for teaching all the school new moves with the skipping ropes. We hope you can come again soon. And there's plenty more! You can click here to see what others have written about our days and why it works. We're going to be putting more pics and letters from our skipping buddies who we've been skipping with very soon, but you can watch some video testimonials from teachers, or you can get in touch with us either via email or by 'phone on 01743 361863 if you're interested in finding out a bit more about what we can do for your school. Speak to Tina, our Head of Difficult Questions + Interesting Solutions if you have any specific objectives that you would like us to try to make happen through one of our days. We're looking forward to hearing from you! You are here: Blog > What do children say about our days?